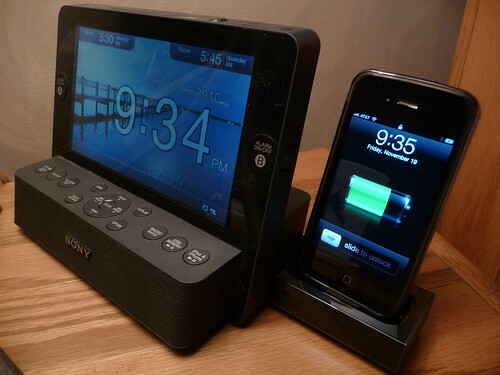 A year ago I was on the hunt for a new clock radio with an iPhone/iPod dock built-in. One would think finding such a device would make for a pretty simple shopping trip right? 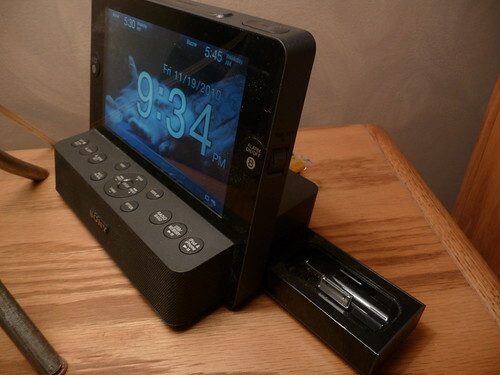 Well there are now several options out there to choose from and while I started with pretty simple needs here, my inner-geek pushed me to find a clock radio that handled more than just the typical tasks. Enter the Sony Dream Machine IFC-CL75IP. 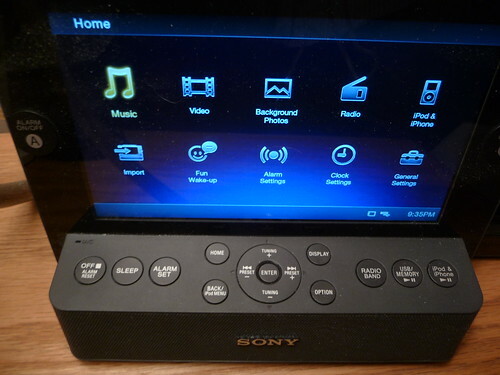 That list actually fits several available clock radio options. But I chose the one that had the cool factor going for it. 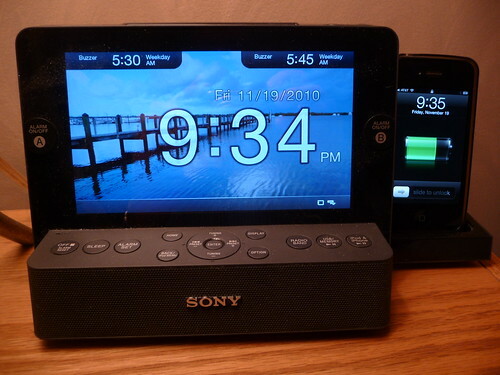 An Engadget story about one particular Sony clock radio caught my eye in a big way and I couldn’t resist. 2-5-7 Day Alarms – Alarms are customizable to do 2-day, 5-day or all 7-days. A must-have feature for me. Sleep timer: 10 min./20 min./30 min./60 min./90 min./120 min. The photo slideshow and background image capability of this device is where it really shines. You can choose a photo to display as the background of your clock radio or have it show a photo slideshow like a digital photo frame. The time will still display while doing this, but you can change how it displays: either in large font that centers on the LCD or smaller on the lower-right corner. 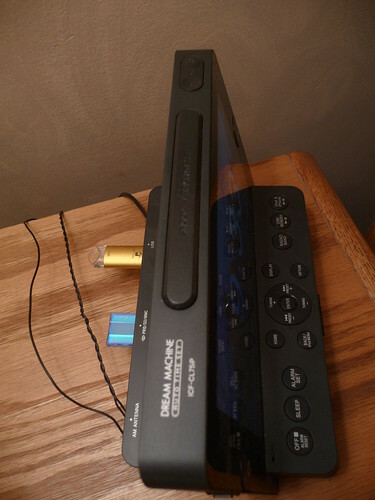 The back of the clock radio has a memory stick port, SD memory card port and USB port all of which can be used for the slideshow or video content. Of course it also includes a 1GB internal storage and can display from your iPod or iPhone. 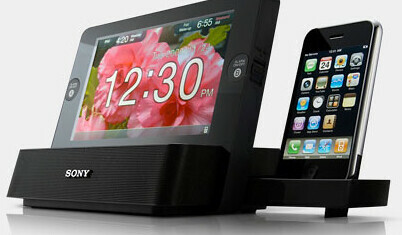 The iPod/iPhone dock is hidden away on the side of the clock radio. It has a tension release tray that you press to open and push back in to hide it back away. It’s functional, but seems a bit flimsy to me. While I get the feeling it could break if not careful I haven’t broken it in the year I’ve owned it – even though I admit my clock radio gets some abuse when I awake abruptly at times. The most important function of this thing is honestly the alarm. Fortunately the alarm works great and has all of the features I need. It’s a dual alarm (it takes two to get my rear up some mornings) and each of the two alarms can be programmed to wake on weekdays (5-days) only, 2-days only (weekends) or every day (7-days). The alarm noise itself can be set to wake you with built-in nature sounds, iPod/iPhone music, radio, a personal message (recorded by you) or built-in buzzer. It also has a snooze function that shuts up the alarm in 10 minute intervals up to 1 hour when you hit the snooze button on top of clock radio. Another feature that is essential with a clock radio that displays so much light due to it’s larger-than-normal LCD screen is the dimmer. When you hit the large, top- snooze button it rotates between four brightness settings. High, Mid, Low and an almost black-dark night mode. The radio works well and has a very good signal for both AM and FM. With your iPhone plugged into the dock you can add Pandora and other streaming like Sirius radio to the mix as functionality which is pretty nice. The menu on the screen will be familiar to Playstation 3 users as it shares some similarities. It’s pretty easy to figure out regardless, but expect lots of settings since it has so many features.The radio is pretty sweet an gets a better signal than the old clock radio I had in exactly the same position. No Remote Control. 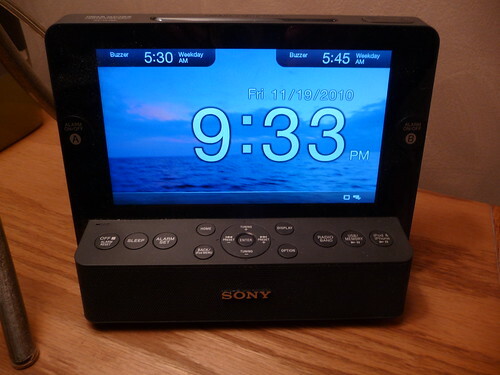 Yes, this is intended to be used as a nightstand clock radio, but with it’s digital photo frame and video playback capabilities, a remote would be a handy addition. Audio quality from the clock radio is passable, but very little bass sound. Music quality is simply not great. Internal “demo” photos can’t be deleted without some work so they get mixed into your slideshow. A few months ago Sony FINALLY came out with a firmware update to fix this, but it’s simply mindboggling that they took so many months to do this – and it takes a little work to do the firmware update via USB thumbdrive. 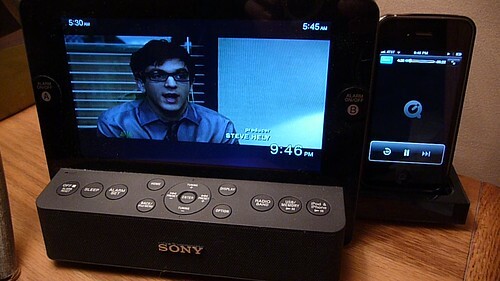 Once I installed the firmware update from the Sony support page I was able to delete those stupid demo photos. This is the very reason I didn’t review this device before the firmware update. I recommend this clock radio with some qualification: If you’re a geek who likes the functionality this thing brings, by all means check it out. 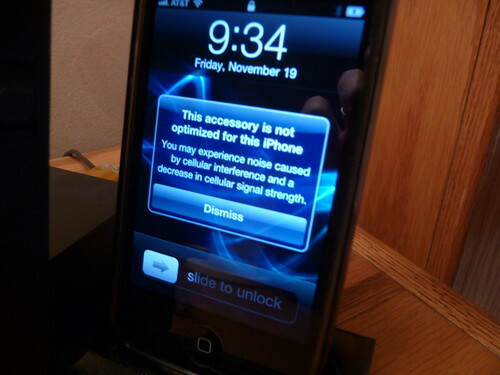 If the sound of “firmware update” gives you chills or worse – doesn’t make sense to you…. stay away. 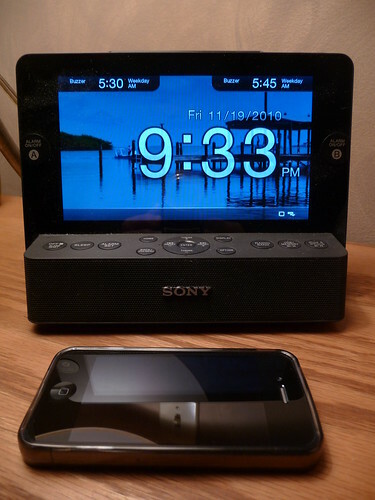 I am extremely happy with my choice of this clock radio with it’s nice LCD screen, great alarm clock functions, photo album display and decent iPod/iPhone dock. But it isn’t for everyone – especially those that like simplicity.